Dear Fellow Rosarians: Spring has officially arrived, and the snow is melting. The bookmarks and members handouts will be ready for our meeting on April 16th for those who renew their memberships. As you know we are always looking for new members so if you know of someone who might be interested, please encourage them to come to our next meeting. We are always looking for ideas for fundraising and Michelle has come up with a great idea. We are going to be selling miniature roses at the next District 16 seminar for the Horticultural Association. (April 6th). We were saddened to hear of the passing away of Grace’s husband Gordon. There is a message later in the newsletter. We will have the information concerning the roses at our meeting so it will give you a chance to put an order on any of the roses that you wish to buy. We are looking forward to hearing from Elizabeth Schleicher, at our April 16th meeting, speaking on the Copenhagen Adventures. We will also have the results from the photographic competition. Looking forward to seeing you all there. Her presentation title is: ‘Copenhagen Rose Adventures’. She and her husband visited Denmark, attending the triennial convention of World Rose Societies in 2018. In this talk she will cover some of the flavour of Copenhagen and the highlights of the World Federation of Rose Societies convention. 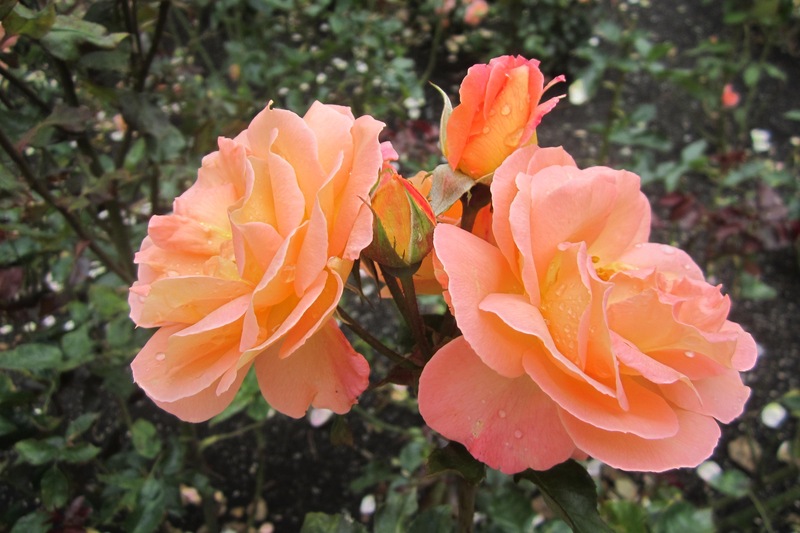 Then on the post convention tour we will visit some private rose gardens organized by the Danish Rose Society which celebrated its 25th Anniversary in 2018. Elizabeth is an excellent photographer so I can guarantee we will all have an excellent program. Also, this evening, the results of our Photographic Competition will be on view. You can purchase some of HRS unique greeting cards with rose photos by our members. The blank card allows you to inscribe any appropriate message to the recipient. Sign up at our first meeting, the evening of April 16th, if you are interested in car pooling to visit the newly renovated rose gardens at the Royal Botanical Gardens, Burlington and visit the Hamilton/Burlington Rose Show the same day. Sign up list will be at April 16 meeting, for members only. This is a way to support a sister Rose Society by visiting their show and get some new ideas, perhaps. There may be an entrance fee.You will be notified with all details later. For further details, contact Edna, 705 721-0484. Tuesday. July 16 – Garden Visit Members only, 6:30 pm. We are looking for an invitation from one of our members to visit their garden for a social visit and to enjoy their gardening efforts. Contact Edna 705 721-0484 if you would like to share your gardens. Once again, this evening is a perk for members only. Fundraising event at District 16 meeting Linda Forster from District 16 has approved the sale of miniature roses at the meeting. The mini roses will be the center piece on each table and will sell for $10.00. The HRS thanks Michelle for her the initiative and work to make this happen. The roses will be in 6” pots and an assortment of colours. Any remaining roses will be made available to the membership for purchase. News flash- OMHS’s (Oro Medonte Horticultural society) the board has agreed to sell any extra unsold HRS rose bushes at their major plant sale on May 25, if we aren’t sold out on May 11 & 18! This sale draws many gardening friends and should be a good opportunity to conclude our rose bush sales. Discussions are still ongoing with representatives of the CRS. We will keep you updated with the progress. It is the desire of the Huronia Rose Society HRS to assist the CRS wherever possible, so they can continue the promotion of growing roses and the school for rose judges. Gordon Kent – We are sad to share that Grace’s husband of 60 years passed away in March. He was a CBC and then TVO employee for years. The family moved to Innisfil in 1975 where they farmed while Gordon commuted to Toronto for work every day. He enjoyed photography, travel. painting, gardening and his church. He lived at Grove Park Home for the past several months. Up until that time, he attended all our meetings with Grace. Our condolences are sent to Grace and their family. Everyone owes a part of his or her time and money to the business of promoting the growth of roses in the Huronia area. By standing together as part of a society we become a stronger voice and authority on the culture of hardy roses. Your ideas and suggestions at our meetings help everyone. We have access to education. Our membership in the society leads directly to advanced education with key note speakers addressing a variety of gardening topics beneficial to all of us. Opportunities to give back to the community. Members of our society provide volunteer support assisting with the Memorial garden. Colleagueship: Being a member is the primary way that people network with people who share common interests. There is still much to be said for periodically meeting people up close and personal for creating friendships. Information. The societies’ emails, newsletters, and website keep you informed. Membership enriches our lives in many ways and provides on-going information about the ever-changing landscape of growing roses. So please fill out the membership application below (if not done so already) and work with people who share the same passion and commitment for the love of the Rose. Welcome, thanks for visiting us - we hope you enjoy your stay, and wish you a successful rose gardening season! Our members will be at the Barrie Farmers’ Market (Collier St.) and both Orillia Markets (Fairgrounds and Downtown) on May 11th and 18th from 8 AM ’til NOON selling potted rosebushes. We will provide written planting and care instructions and answers to any rose growing problems you may encounter.